Andrea Polli is an artist and writer, blending art and science through tech art to make work related to environmental issues. She is currently an Associate Professor of Art and Ecology at the University of New Mexico and got her MFA from SAIC. The Horticultural Spa, by Rachel Wingfield and Mathias Gmachi of Loop.pH, is a project that revamps concepts of the past to create an unique experience. The project aims to accomplish what the Roman baths of old did: create an intimate, relaxing, social space. The bath idea is translates into the form of herbal scented fog. This is made even more relaxing by the presence of music and plants. The social side of the project is also to teach people ways to reduce consumption of water that perhaps they had not considered before. In particular, it is showing people the benefits of communal consumption of water, as opposed to individual. As a student, artist Andrea Polli, received a PhD in Computing, Communications and Electronics from University of Plymouth in the UK, and received a MFA in Time Arts from the School Art Institute of Chicago. She’s currently a Professor Art and Ecology in University of New Mexico’s College of Fine Arts and School of Engineering. 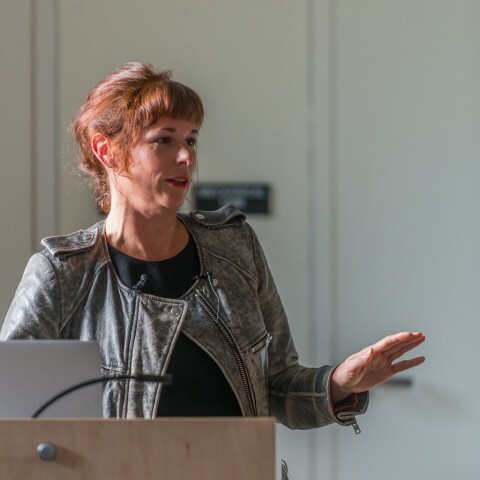 Along with being a professor, she creates interactive digital installations that deal with environmental public policy. For example, her installation “Particle Falls” is a visualization of the pollution particles in a part of Santa Clara County. Polli created the installation that has sensors that can count and show particles of pollution with laser light scattering in real time. Polli chose to install this in Santa Clara County because the county failed an air quality evaluation. I really enjoyed reading about Polli’s work because she creates her installations to inform the public about ecology and environmentalism, topics that we all need to know about so we can make changes in how we act today. Particle Falls from Andrea Polli on Vimeo. 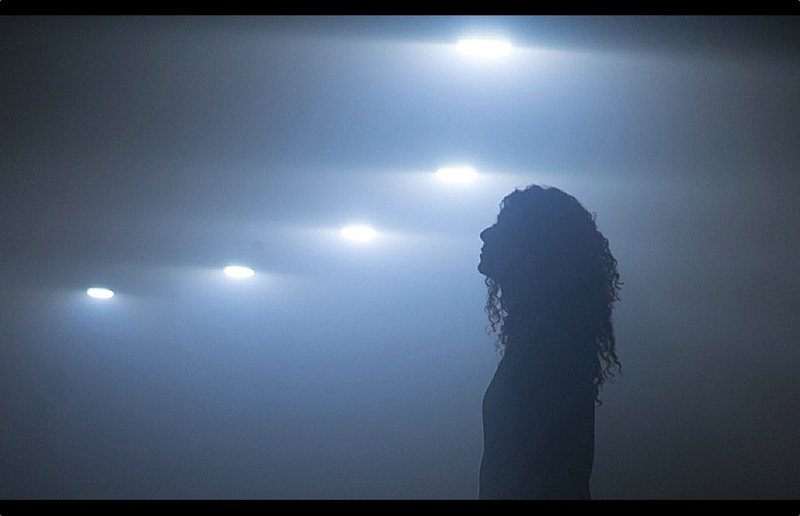 Momentum is particularly relevant to this week’s theme, because the woman in question, Keri Elmsly, is the director of United Visual Artists, a collective that focuses on large-scale interactive installations. So all the amazing work produced by this group is under her power. The actual machines use two stepper motors that carry out the simple pendulum motions. Though the idea was simple, Keri Elmsly must have been a main driving force in order to produce the project with this final cinematic, immersive effect. What I like most about this piece is how the pendulums switch from swinging in a natural motion to swinging in a robotic one. Because of the creators’ control of code, Momentum controls physical objects in such a way that blurs the lines between organic and technological. Speaking of interactive artists who just happen to be women reminds me of some events last year we don’t really like to talk about. The #GamerGate movement targeted women in the gaming industry and sent death threats . 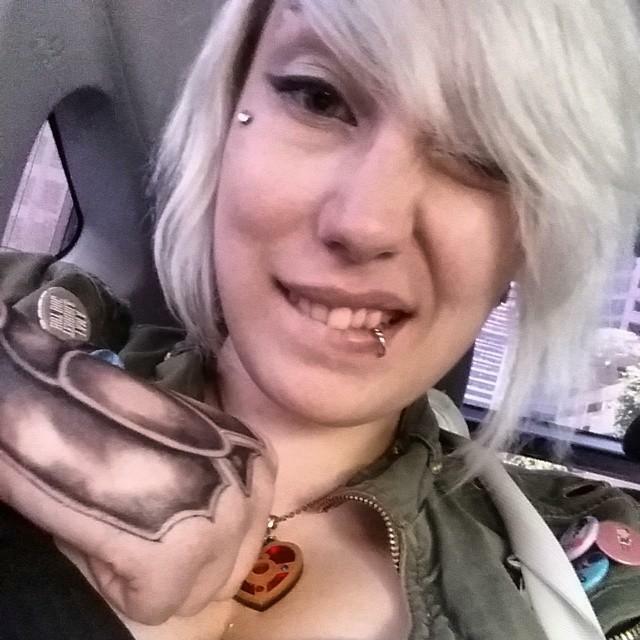 The most prominent victim of harassment was indie game developer Zoe Quinn. What makes this especially tragic is the truly innovative interactive story she was telling. 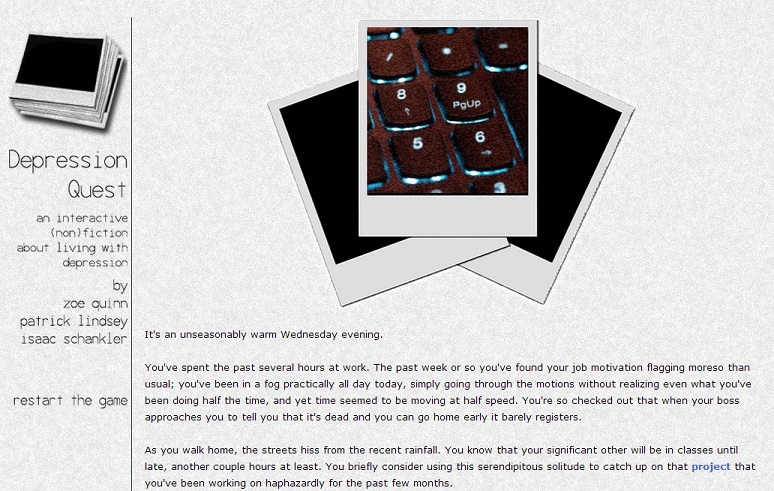 Depression Quest depicts the chilling reality of living with depression in the modern age. It puts you in a position where you are often aware of the choices you must make in order to escape your depression and yet find yourself unable to make them. This is accomplished by subverting the tropes of most choose-your-own-adventures and blocking off one or two of the choices. You are forced to sympathize with the situation most depressed people find themselves in. The scene is also set with the TV static motif, the use of photographs as if you cannot directly see anything you’re doing, and the eerie use of sound. It’s a sad state of affairs when a woman in the industry can make a powerful work like this and be bullied and threatened as a result. Real change is needed for the inclusion of women in interactive media and computer science. You can play Depression Quest for free here or donate money, some of which goes to the National Suicide Prevention Hotline. In an August 2015 blog post Allison Parrish describes the bot called The Ephemerides that she created which pairs a computer-generated poem with a photo from NASA’s Opus database and posts them on Twitter. To make the program that creates the poems Parrish used text from two books: Astrology by Sepharial and The Ocean And Its Wonders by R. M. Ballantyne. Parrish broke each book into individual sentences, then broke down the sentences into clauses, then broke down the clauses into grammatical constituents. This process created a database of clauses and constituents from which the program selects. The constituents are organized based on their part of speech and/or grammatical role. Parrish explains that to make a poem, the program randomly selects a clause and then replaces each constituent in that clause by randomly selecting a constituent of the same part of speech or grammatical role. This means that although the poems are randomly generated, they do maintain some grammatical integrity. The Ephemerides also selects the NASA images randomly. The images come from space probes like Voyager, Cassini, and Galileo. Parrish explains that she did this project because she sees a link between space probes and generative poetry. She says that they both “venture into realms inhospitable to human survival and send back telemetry telling us what is found there.” To Parrish, the realm of the space probe is outer space and the realm of generative poetry is nonsense. I like how Parrish’s work draws a connection between the unknown and hard to understand universe outside of our planet and the similarly unknown and hard to comprehend nonsense created with generative poetry. Combining these two big ideas makes her work confusing, interesting, and that much more engaging. As Parrish points out, the poems and the photos are all randomly selected, so the meaning that a person ascribes to them is coming from inside that person. I find it inspiring how although this project is computer-generated, the meaning and impact of it on each viewer is self-generated from within. I like it when poetry doesn’t always make sense and it requires the reader to think deeply to discover its meaning because then the reader has the ability to interpret the meaning for themselves on a personal level. The reader then can almost ascribe their own meaning to the poetry. These generative poems have that quality. 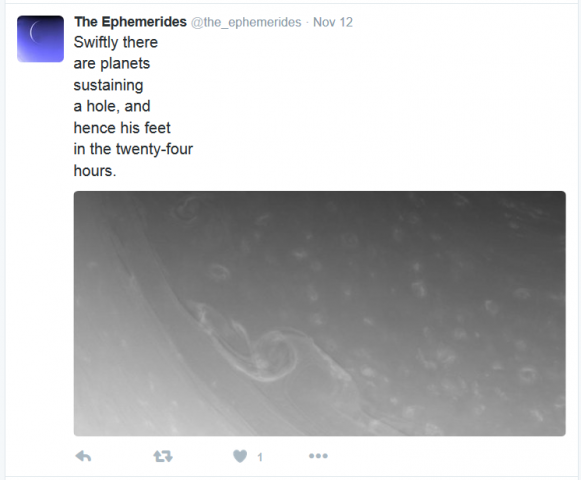 Check out The Ephemerides on Twitter and visit Parrish’s blog to learn more. And here is a video of Parrish’s 2015 Eyeo talk. For lookingoutwards 10 I decided to look at Light Barrier by kimchi and chips. The project is a light installation that creates a virtual object that can move through space. Kimchi and Chip was inspired to do this through a fascination with natural light and impressionist painters. They researched about color and the idea of passing time. I admire how blunt she is about why she did the project. The work is very interesting to me because I did a piece like this in Korea when I was getting ready to apply for Carnegie Mellon University portfolio. Also I’m a Korean so you know. Kimchi and Chips is a Seoul(capital of Korea) based studio founded by Elliot Woods (UK) and Mimi Son (South Korea). They are famous for exploring interactions between people learning technical realms as well. This week I chose to explore the work of Camille Utterback. Camille received her BA in Art from Williams College, and a Masters degree from The Interactive Telecommunications Program at NYU. She’s installed a huge number of works throughout the States and has received great public acclaim for her accomplishments such as the MacArthur Foundation Fellowship (2009), a Transmediale International Media Art Festival Award (2005), a Rockefeller Foundation New Media Fellowship (2002)…the list goes on and on. And it’s easy to see why when one observes her work. For example, her “Dances of the Sacred and Profane” (2014) is a beautiful example of how real life, physical art (dance and movement) interacts and influences digital displays on screen. but it seems to register sound. This project stood out to me because it is a public installation of art meant to be enjoyed by everyone and inspire change, rather than a piece of art in a museum meant to be admired. Yael Braha is a freelance artist from Italy who dabbles in design, filmmaking, and art. She works a lot in interactive media, including pieces like the Tree of Changes. She studied graphic design at the European Institute of Design in Rome, and fine arts in cinema at San Francisco State University. 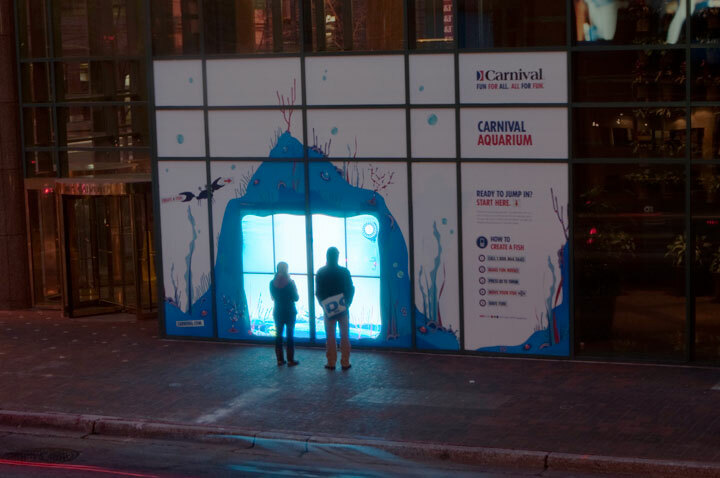 This project is an interactive aquarium that is installed in store windows in 6 cities in the US. 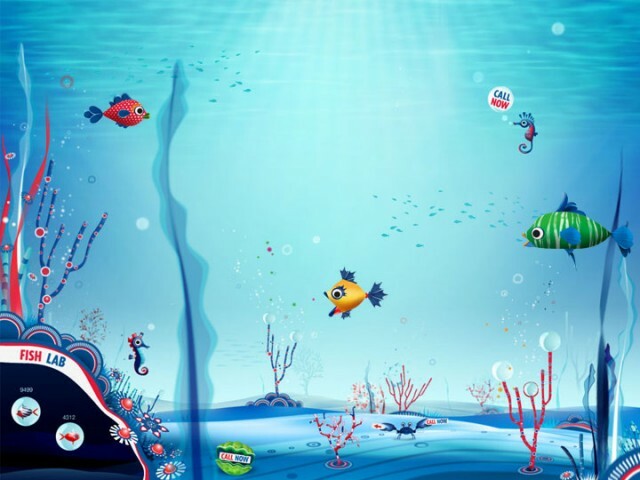 I like this project because it allows you, with just the use of your phone, to create a fish using their voice and then move that fish with a keypad on your phone. 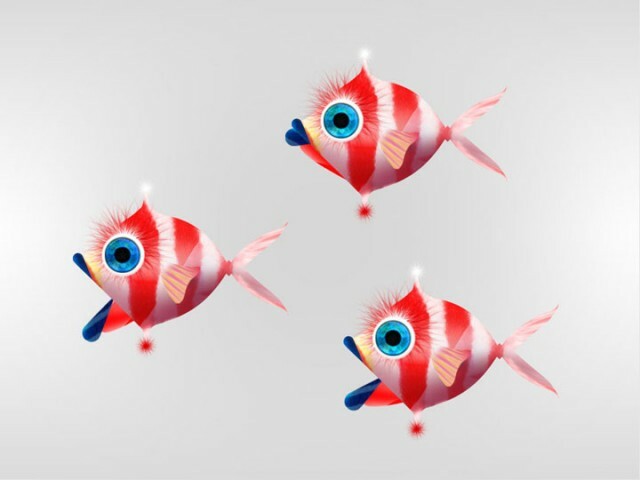 It also allows the user to evolve their fish when they call back later. Since it’s in store front windows, it allows anyone with a phone to play so it opens up the amount of interactions to thousands instead of just hundreds. I admire that each fish is unique because they’re created from people’s voices so no fish could ever be the same. The creator is Emily Gobeille, who is an award-winning designer and artist. She specializes in creating interesting design experiences through the merging of technology and design. She emphasizes on interaction and systems built to support new discoveries and playfulness.